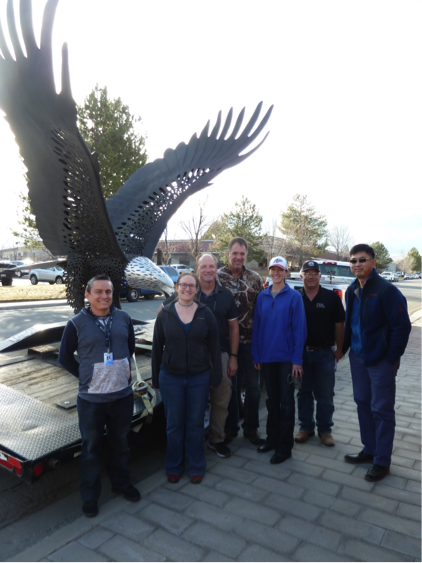 CHEMEON’s Dr. Sjon Westre and Dr. Catherine Munson get an up close look at the “ Carson City Eagle” in a recent visit with the Nevada DOT team of engineers and contractors responsible for the placement of the 800lb. all aluminum “Carson City Eagle”. The “Eagle” has a permanent perch in Nevada’s capital city at the southern end of the Carson City bypass. The finely detailed sculpture was forged out of powder coated aluminum created by Ivak Cooper, a professional contractor and welding educator based out of Idaho. Click this link to read the full article.